Check out this gorgeous cover for AUSTIN: A Sexton Brothers Novel by Jeannine Colette and Lauren Runow! AUSTIN will hit your kindle on September 20, 2018! Don't forget to add it to your TBR and pre-order your copy now! I’m the girl who’s always picking up the pieces of other people’s mistakes. I accidently cause one false start, and now I’m being pulled into a guy’s car—who everyone only knows as Falcon—before an illegal street race. He may not want anyone to truly know who he is, but he’s met his match. People know I run these races. They know not to mess with me, or my car. When the identity of the girl who causes a false start is revealed, I have to make an example of her. Letting her see who I am was never the plan. Neither was running into her the next day as my brother’s new assistant. She said she wanted nothing to do with me, but when I yank her into a janitor’s closet, making sure she keeps my secret is the last thing on my mind. She may want more than my secrets, but my racing may be the last thing I try to hide. Jeannine Colette is the author of the Abandon Collection - a series of stand-alone novels featuring dynamic heroines who have to abandon their reality in order to discover themselves . . . and love along the way. 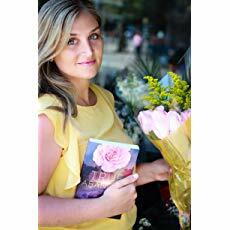 Each book features a new couple, exciting new city and a rose of a different color. A graduate of Wagner College and the New York Film Academy, Jeannine went on to become a Segment Producer for television shows on CBS and NBC. She left the television industry to focus on her children and pursue a full-time writing career. She lives in New York with her husband, the three tiny people she adores more than life itself, and a rescue pup named Wrigley. Jeannine and her family are active supporters of The March of Dimes and Strivright The Auditory-Oral School of New York.